Houses built between about 1920 and 1950 were almost invariably fitted with glazed fireclay, ‘Belfast pattern’, sinks . These were supported by heavy iron cantilever brackets built into the wall. They had a built-in weir overflow and a separate, hook-on, wooden draining board. Water supply was from bib-taps protruding from the tiled wall surface behind the sink. These sinks have been superseded, for both new and replacement work, by sink units with a stainless steel or enamelled pressed steel sink and integral drainer. Sinks of either of these materials are more attractive in appearance, more easily cleaned and less damaging to accidentally dropped crockery than those of glazed fireclay. Enamelled steel sinks are available in a number of colours but suffer from the disadvantage that the enamel is liable to accidental damage. For this reason a stainless steel sink is the modern housewife’s most usual choice. Stainless steel sinks designed for sink unit installation are provided with tap holes to take pillar taps or a sink mixer. They may have a built-in overflow but are nowadays more likely to have an overflow hole only provided. 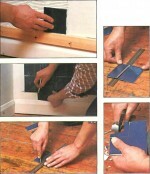 The overflow pipe is intended to be a flexible one fitted into the trap in the same way as the overflow of a modern bath. Since both stainless steel and enamelled pressed steel are thin materials a spacer or top-hat washer must be slipped over the tail of each tap before the back-nut is screwed home. When installing a new sink unit the taps should be fitted before the unit is placed in position. Waste, trap and overflow are fitted as for a bath. Where the unit has a double sink a trap is fitted only under one outlet-the one nearer to the waste pipe. The waste from the other section of the sink is taken untrapped to connect above trap level. If a sink waste disposal unit is to be fitted the sink must have a 3Viin waste hole instead of the standard l 1/2in hole. The waste holes of stainless steel, but not enamelled steel, sinks can be enlarged to this size with a tool obtainable from the supplier of the unit. Waste disposal units are fitted by placing a rubber or plastic washer round the outlet hole and inserting the flange of the unit. 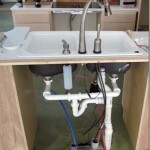 The unit is then connected beneath the sink by means of a snap fastening. The outlet of the disposal unit connects to a trap in the usual way. Waste disposal units are operated by an electric motor and will grind soft household and kitchen waste to a slurry that can then be flushed into the drain by running the cold tap. Although wash basins, or lavatory basins as they are referred to in builders merchants’ catalogues, may be made of enamelled pressed steel or of plastic materials the traditional ceramic basin retains its popularity and is the kind most likely to be chosen for new or replacement work. Ceramic basins may be either wall hung or pedestal in design. Pedestal basins are often preferred for bathroom use because of their appearance and their capacity for concealing water supply and waste pipes. Modern pedestal basins are always provided with concealed hangers or wall brackets to help support the basin’s weight. The height of a pedestal basin is, of course, decided by the pedestal. Wall-hung basins may be fitted at any height convenient to the user. Since one bends over a basin to wash it should be set at a lower level than the kitchen sink-32in from floor level to rim is usual. Particularly with wall-hung basins it is important to check that the wall is capable of supporting the weight of the basin and someone leaning on it. Breeze partitions offer a somewhat dubious support and it is wise to use a pedestal basin in such a position. Taps, or a basin mixer, are fitted in the same way as they are in a sink unit. The thicker material of a ceramic basin makes it possible to use a flat plastic washer between the back-nut and the material of the basin. Do not overtighten the back-nut. Ceramic basins are very easily damaged in installation. Basins of this kind have a built-in or ‘secret’ overflow. The waste fitting must therefore incorporate an overflow slot. When this fitting is bedded down into the waste outlet, care must be taken to ensure that the overflow slot coincides with the outlet of the built-in overflow. The basin must, of course, have a trapped outlet. Chromium plated brass or plastic bottle traps are space saving and neat in appearance. They can be obtained with adjustable inlets that permit easy connection to an existing waste pipe in replacement work. Enamelled steel or plastic wash basins are usually inset into a toilet table to form a ‘vanity unit’. Such a unit may be installed in either a bathroom or a bedroom. In the latter situation they constitute an extremely attractive, and useful, piece of bedroom furniture. A vanity unit may be regarded as the ablutionary equivalent of a sink unit. Apart from the cold water supply-which will normally come from a storage cistern and not from the main—it is plumbed in in exactly the same way. Hot water supply to the wash basin will probably be taken from the household domestic hot water system. However, where the basin is used for hand washing only and is remote from other plumbing fittings, the provision of an instantaneous electric water heater providing a spray for hand washing can be an economy. A heater of this kind can be very useful for a basin in a cloakroom or w.c. compartment used only occasionally.